Met these two (four?) in downtown Albuquerque the other day. They were dealing with a homeless man peeing in a doorway not far from the high school. Despite my inopportune arrival they were terribly polite and took time to answer my questions. 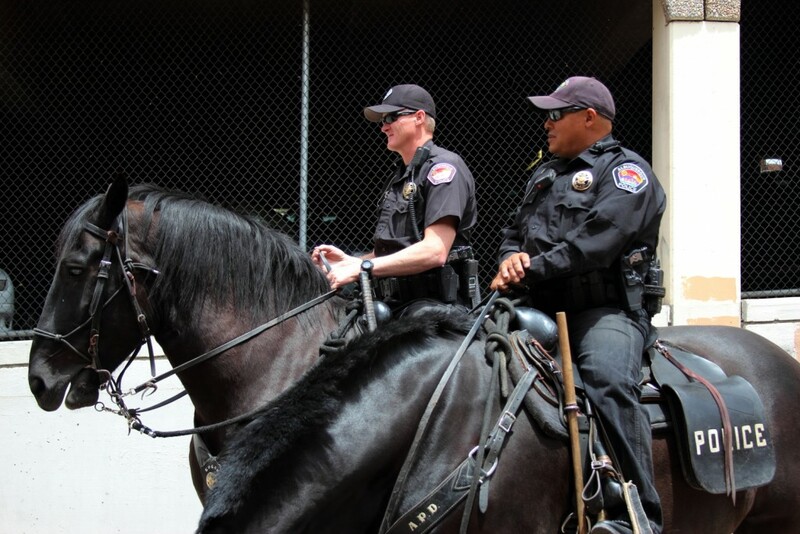 The APD Horse Unit has been in operation since 1977. The two gentlemen pictured are the only two full-time mounted police officers, with over seven horses stabled in the North Valley. They ride a different horse each day. The horses, Max and Jake are both draught horses. Jake, the larger horse stands at a towering 17.2 hands high and Max is about 1600 lbs (725kg) in weight. Max’s rider looked a little embarrassed and explained Max is on a diet after over-eating during winter. These types of horses are unusual to see as riding horses. They are bred to be working animals, more often seen pulling carts or plowing fields. The officer told me that the bone density of the type was well suited to road work, their temperament is calm, and there is a psychological advantage during crowd control using such massive beasts. I agree, you don’t want to get stepped on by either of these horses. Their feet too have special shoes, including a strip of leather between hoof and metal, that helps as a shock absorber on unforgiving tarmac. Both officers were happy with their detail, and were so friendly and professional that I felt proud to see such progressive (if old-fashioned) community policing. You can help support the APD Horse Unit by purchasing culinary seasonings (this is New Mexico) in a range named Hot to Trot. You can also keep up to date with sightings on their official Police Department Horse Unit Fund Facebook page. As the officer said to me “The only thing here that’s photographed more than us is the balloon fiesta”.